To say that Darth Vader has fallen out of favor with Emperor Palpatine would be an understatement. The old wrinkly Lord of the Sith talks down to his apprentice in a manner that would get most people force choked into oblivion. However, Vader is playing it cool for now, and he needs to. The Emperor has hired a mysterious bounty hunter for a secret mission and is keeping Vader out of the loop. Vader uses some of his own resources and comes to the conclusion that he needs to build a secret army to combat whatever might come his way. In this issue, Kieron Gillen brings Darth Vader back to Geonosis where he is looking to reactivate a battle droid factory in order to create his army. Now, the robots who said “Roger. Roger” throughout the prequels doesn’t seem to be the best idea Vader has ever had. However, for the sake of the story where those droids did some serious damage in the Clone Wars, we can pretend it is a good idea. Plus, Vader is on the outs with Palpatine and this could be an act of desperation, as it the quickest way to create an army in record time. Gillen also introduces some new characters who aid Vader in his quest for power and they shine on multiple occasions. Archaeologist Dr. Aphra is a spunky female Indiana Jones in space who helps Vader acquire items that were thought to have been lost forever. I was worried at first that she would only serve as comic relief, but she holds up her end of the bargain while consistently coming within an eyelash of crossing the line with Vader. 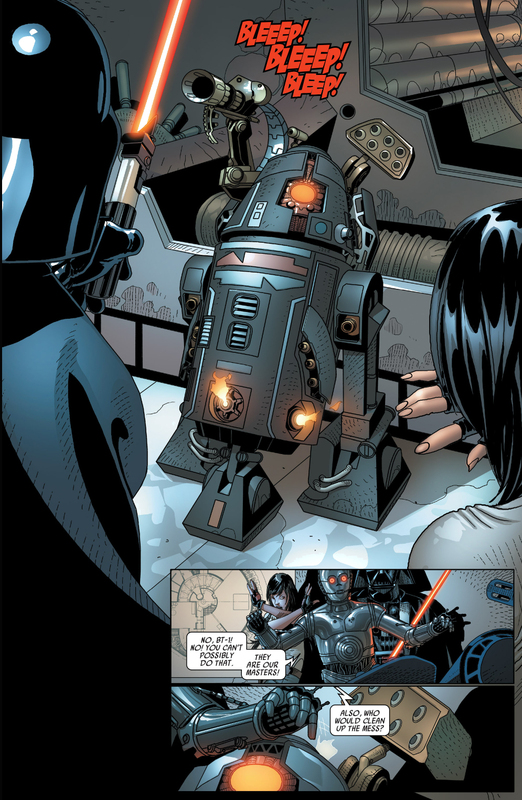 We also have the droid duo of Triple Zero and BT-1, who are a homicidal version of R2-D2 and C-3P0. Salvador Larroca does a great job of making their presence felt as their likeness to the lovable counterparts gives the reader a false sense of security. Then BAM! BT-1 ejects a bazooka out of his top compartment and cleans house without a second thought. Most of the past Star Wars comic books did a great job of accentuating the fact that Vader is not to be trifled with. However, this time, Vader’s back is against the wall and it kind of feels as if he is on the run. Gillen puts Vader’s ruthlessness on full display when he makes a unexpected discovery in the catacombs of Geonosis. You think he would show a little leniency given his current predicament but who are we kidding? Vader takes out his lightsaber and goes to work and Edgar Delgado makes the imagery stand out with his detailed coloring. This series is becoming one of my personal favorites. Darth Vader is an iconic character in pop culture and Kieron Gillen along with the rest of the creative team have not only produced a work that makes you say “This is Star Wars”, but also makes the reader feel that this is the Darth Vader they have paid to see.